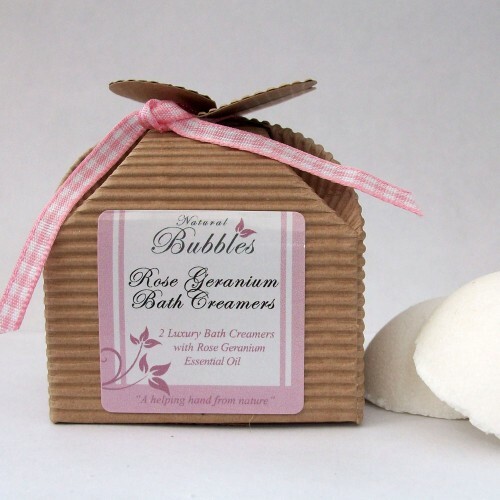 Two luxury handmade creamers made with pure Rose Geranium Essential Oil and lashings of Shea Butter and Cocoa Butter. Rose geranium is very useful for balancing the mind and body. It is also used for circulatory and skin problems such as bruises and broken capillaries whilst Shea Butter moisturises the skin. You will certainly notice the difference after this bath time treat! Sodium Bicarbonate, Citric Acid, Zea Mays Starch, Butyrospermum Parkii (shea butter), Theobroma Cacao (cocoa butter), Pelargonium Graveolens (rose geranium), Citral, Geraniol, Citronellol, Limonene, Linalool.